Get Creative with Pastel Painting! Being a very creative person and after enjoying drawing and fabric painting throughout my life, on Saturday I attended my very first pastel painting art class! Along with my daughter Jacqueline and friend and sewing student Maureen we had the most fabulous day! Here is my painting ‘Dashing Roses’ in its early beginnings and with some pastel colour to bring it to life! 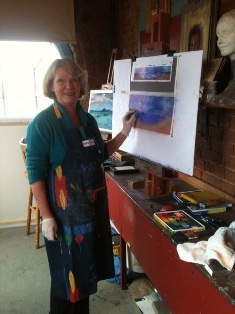 Maureen showing me her expert techniques with landscape pastel painting! And quickly brought it to life with colour! Drawing and painting is a wonderful way to spend an afternoon and lose yourself in your creative flow. If you haven’t tried it I highly recommend it!